Is it time for Broncos to bench Manning for Osweiler? Peyton Manning is showing his age, but going to Brock Osweiler would be a bit drastic. 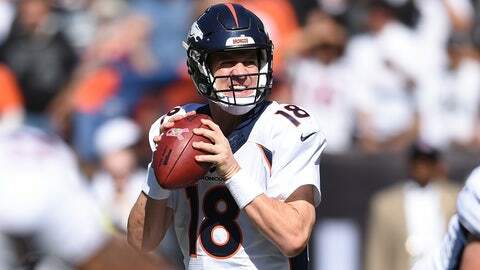 Peyton Manning completed 22 of 35 passes for 266 yards in a 16-10 Broncos win over the Raiders on Sunday. The legendary quarterback did not throw a touchdown pass, though, and was picked off twice. For the season, Manning has tossed six touchdown passes and seven picks. This prompted one reporter on Monday to ask Denver head coach Gary Kubiak if it was time to move on from the 39-year-old signal-caller. Gary Kubiak asked if it is time to play Brock Osweiler. "No. Peyton is doing just fine." While Manning is obviously showing his age, the reporter might be a little unfamiliar with the standings. The Broncos are 5-0.